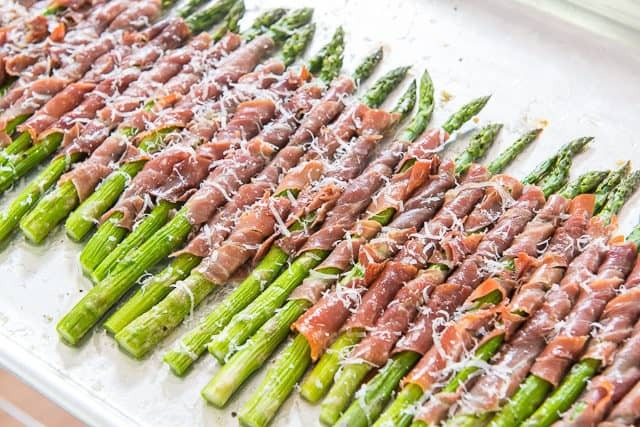 Prosciutto Wrapped Asparagus is a simple and classic appetizer that is suitable for many different eating preferences. It can also be made ahead! 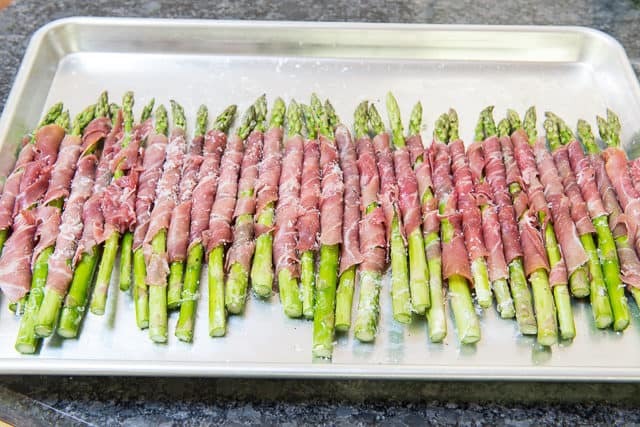 When I worked at a restaurant in high school, prosciutto wrapped asparagus was one of the most popular appetizers on the menu. I didn’t grow up eating it, but I quickly understood its appeal once I tried some. 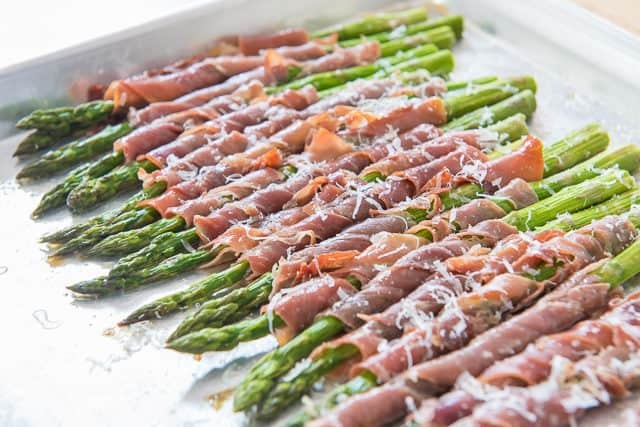 Ordinarily it’s just an asparagus spear wrapped in high quality prosciutto, but I like adding parmigiano reggiano to the mix, which makes it a pretty powerful trifecta of ingredients. If you can find thick asparagus spears, those are best here, but this works just fine with thinner asparagus too. Even pencil thin asparagus can be used, but in that case I’d recommend bundling 2-3 of them together at a time, just so the ratios aren’t too meat heavy. Start by trimming the asparagus. Instead of snapping each one by hand, I look for where the stalk turns from green to grayish purple, and cut a centimeter above where the color change happens. The grayish purple part is where the asparagus spear gets more tough and stringy. Feel free to save them for a homemade vegetable stock! Move it around with your hands to distribute the seasoning. 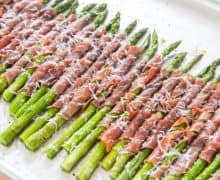 For wrapping the asparagus, lay prosciutto slices on a board, and slice each one in half down the length of each piece. Then grate or zest parmesan cheese all over the prosciutto. It’s fine if it looks like a mess, I promise it won’t once you’re done rolling. Roast the asparagus for about 10 minutes, keeping in mind the total cook time depends on the thickness of the asparagus spears. The asparagus is done when it limps slightly when you pick it up. It should still be somewhat firm, but tender. If you want to prep the asparagus ahead of time, you can roll them a day in advance, then bake them when you’re ready to serve. 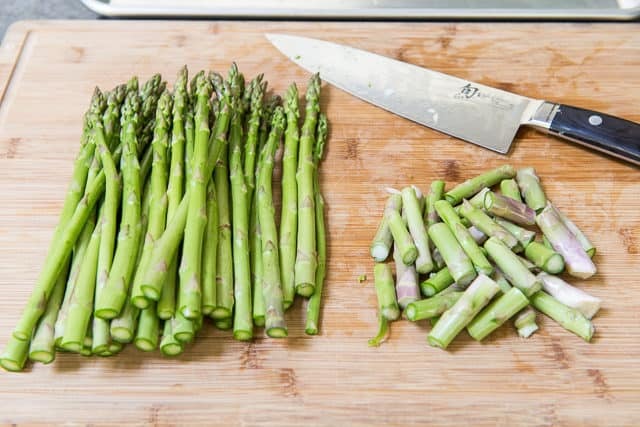 Trim the tough and fibrous grayish purple ends off the asparagus. 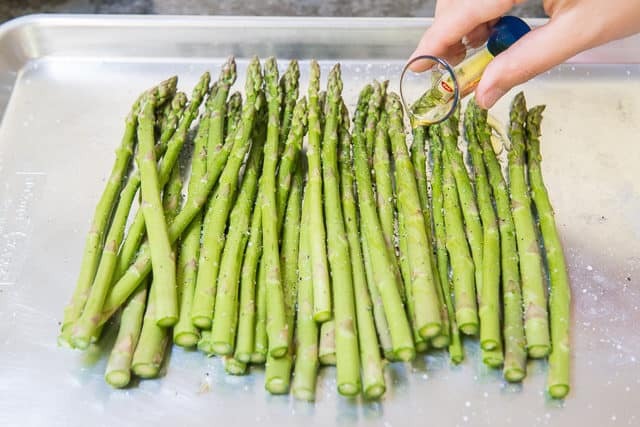 Place the asparagus spears on a sheet pan, and drizzle with olive oil, salt and pepper. Toss well to coat. Lay the prosciutto slices out onto a cutting board. 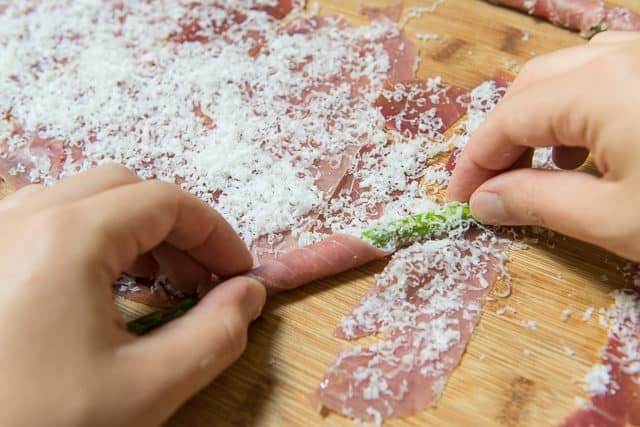 Slice each in half down the length of the slice, then grate a thin layer of parmigiano reggiano on top of all the prosciutto. 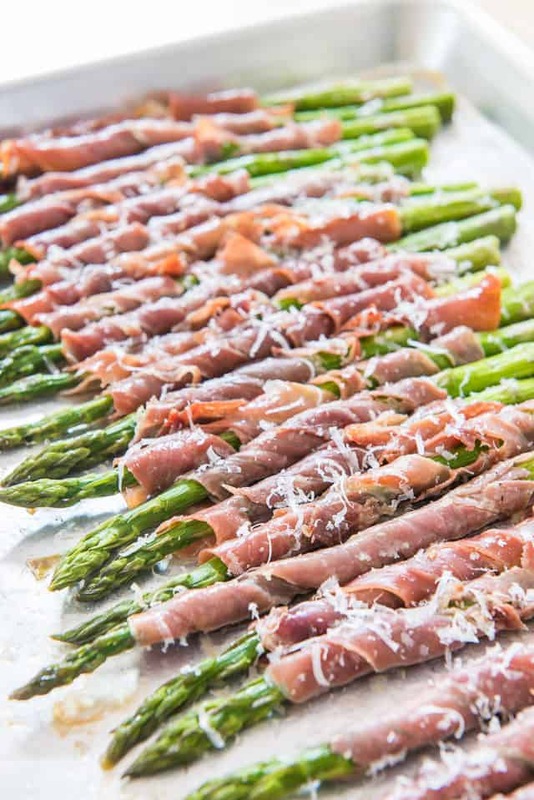 Roll each asparagus spear with the parmigiano prosciutto, then arrange in a single layer on the sheet pan. Bake for about 10 minutes (but check after 6-7 because thicknesses will vary), until the asparagus is still somewhat firm, but tender. It should limp slightly when picked up...or you can just taste it and see if it's done to your liking. Grate more parmesan on top if you'd like, and enjoy! *Prosciutto varies hugely in quality. Try to get prosciutto di parma or another high quality one. Post updated with new photos, writing, and tips in September 2018. Originally published August 2011. I love asparagus!! 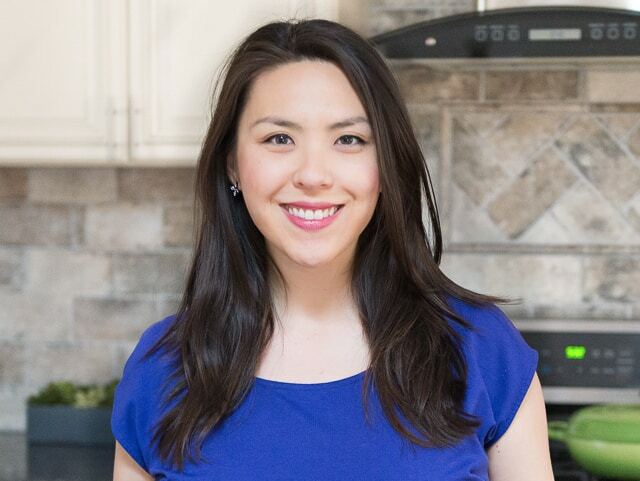 Great recipe to wrap it and top with cheese! An amazing classic, looks to be done very well. Love the photography – as usual – delicious. Can’t beat prosciutto wrapped asparagus. It’s such a genius flavor combo. I ate at a delicious restaurant this past weekend and ordered the prosciutto wrapped grilled asparagus with egg and grated parmesan on top. I was in heaven, and plan to recreate it very soon!